With the holidays quickly approaching, I can already smell the cinnamon in the air. Many of us have this aromatic spice in our spice cabinet but rarely use it until holiday festivities begin. So I started to wonder: what are the health benefits of cinnamon? And should I be incorporating this spice into my diet throughout the year? What I found was very interesting. There are different types of cinnamon, and the type of cinnamon you use may be crucial if you want to reap the most health benefits. Cinnamon is a spice that has been used for thousands of years. Reportedly, the Romans used it to provide relief from respiratory and digestive issues. And in ancient Egypt, it was so rare and valuable that it was given as gifts to kings. Some reports say cinnamon was even more valuable than gold. Cinnamon is made from the inner bark of trees called Cinnamomum. It gets its inviting, overwhelming beautiful flavor and scent from the oily part of the bark. This oil is rich in a compound called cinnamaldehyde, which reportedly has numerous health benefits. Cinnamon is exported as cinnamon quills from four main countries: Indonesia, China, Vietnam and Sri Lanka. There are two main types of cinnamon: Ceylon (native to Sri Lanka) and Cassia (native to China). Cassia cinnamon is more commonly used in the United States and Canada. Ceylon is often referred to as “true cinnamon,” and there may be a reason for this. Cassia cinnamon contains varying amounts of a chemical called coumarin, which might not be good if you have liver disease. In most cases, cassia cinnamon doesn’t have enough coumarin to make you sick. However, for some people, such as those with liver disease, taking a large amount of cassia cinnamon might worsen their condition, according to the National Institutes of Health (NIH). So if you have liver disease, talk to your doctor about incorporating cinnamon into your diet. Although expensive, Ceylon cinnamon may be preferred due to its ultra-low coumarin levels. The coumarin in Cassia cinnamon may also act as a natural anti-clotting agent, so people on blood thinner medication need to proceed with caution and speak with a doctor about consuming cinnamon. Another recently available low coumarin cinnamon substitute has been found, which is obtained from the leaves of Cinnamomum osmophloeum in Taiwan. 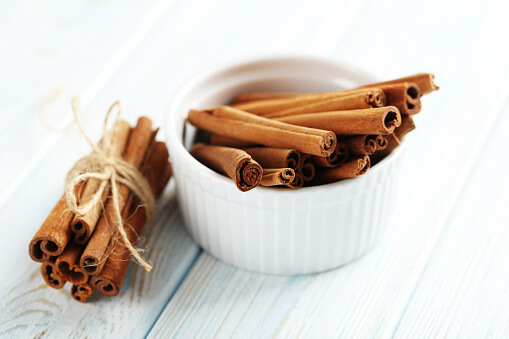 So now that you know more about the kinds of cinnamon available, let’s take a closer look at some of the health benefits of this warm, inviting spice. Cinnamon may be a powerful antioxidant. In a study that compared the antioxidant levels of 26 spices, including oregano and garlic, cinnamon was the winner. Antioxidants, which are found in many plant-based foods, are great anti-inflammatories. Reducing inflammation is key in helping to prevent a variety of diseases, including cancer, arthritis and heart disease. Cinnamon may be great for your heart. Cinnamon may lower your risk for developing heart disease. Triglycerides, which are a type of fat found in the blood, may rise after eating a high-fat meal. And regularly eating high-fat meals may increase the risk for developing heart disease. A study found that consuming cinnamon and other spices is associated with lower triglyceride levels. Cinnamon may also lower bad cholesterol levels. Cinnamon may help with managing diabetes. This spice may help lower blood glucose levels in people with Type 2 diabetes. There is proof of this in a 2003 study involving 30 men and 30 women with Type 2 diabetes. Participants were divided into six groups. Groups 1, 2, and 3 consumed 1, 3, or 6 g of cinnamon daily (for 40 days). And groups 4, 5 and 6 consumed placebo capsules matching the number of capsules consumed for the three levels of cinnamon. “After 40 days, all three levels of cinnamon reduced the mean fasting serum glucose (18-29%), triglyceride (23-30%), LDL cholesterol (7-27%), and total cholesterol (12-26%) levels; no significant changes were noted in the placebo groups,” according to study notes. On top of that, participants who consumed the cinnamon still saw the positive effects when the 40 days were up, 20 days later during which period they consumed no cinnamon at all. People who have diabetes should consult their doctor before incorporating cinnamon into their diet. Cinnamon may disrupt the effects of drugs taken for diabetes. Cinnamon may be a great, natural antimicrobial. Cinnamon may be able to ward off harmful bacteria, fungi and viruses. Reportedly, in the Middle Ages when people did not have refrigerators, cinnamon was used as a natural food preservative. These powerful preservation capabilities of cinnamon are likely due to its high level of antioxidants. It makes sense that antioxidants would prevent “aging” in food, as they also help slow signs of aging in people. Cinnamon has also been said to have been used for embalming in ancient Egypt. There are reports that cinnamon may help fight off the common cold, stomach bugs and yeast infections. It also has been used to treat bronchitis, in traditional medicine. “Some studies showed that cinnamon extracts and essential oils could be active against oral cavity infections,” according to the National Institutes for Health (NIH). The NIH says the cinnamaldehyde component is responsible for the antimicrobial activity. Cinnamon may be great for the brain. “In addition to being an antioxidant, anti-inflammatory, antidiabetic, antimicrobial, anticancer, lipid-lowering, and cardiovascular-disease-lowering compound, cinnamon has also been reported to be effective against neurological disorders, such as Parkinson's and Alzheimer's diseases,” according to the National Institutes for Health (NIH). Tau proteins are abundant in nerve cells, and too much of these proteins or a mutation of these proteins are believed to be one of the causes of dementia, like Alzheimer’s. Some studies found that compounds in cinnamon may reduce tau aggregation. You may also be surprised to find out that cinnamon is high in the mineral calcium. Just one teaspoon of ground cinnamon contains 26 mg of calcium. Of course, calcium is important for building and maintaining strong bones and teeth. This mineral is also important for maintaining hair and nail health in perimenopausal and menopausal women. Adequate calcium intake may also decrease your risk for colorectal cancer. Add cinnamon to your coffee or tea, oatmeal, cereal, granola, sliced apples, sweet potatoes and more! I love to add it to date and banana smoothies with almond milk. Do this throughout the year to spruce up your meals and boost your overall health.